The fuel supply system of a diesel engine can be called as the heart of the engine, since the engine performance directly depends upon the proper functioning of this system—which must supply, meter, inject and atomize the fuel. Fuel injection systems are manufactured with great accuracy, hence they are costlier. Fuel will flow either because of gravity or fuel feed pump, which is provided to supply fuel through the filter to the injection pump. Which pumps the fuel to the injectors which are provided in the cylinder heads. In this case fuel is injected under the pressure of air. For supplying high pressure air multistage air compressors are required, which are very much costly and hence this system is not in use. 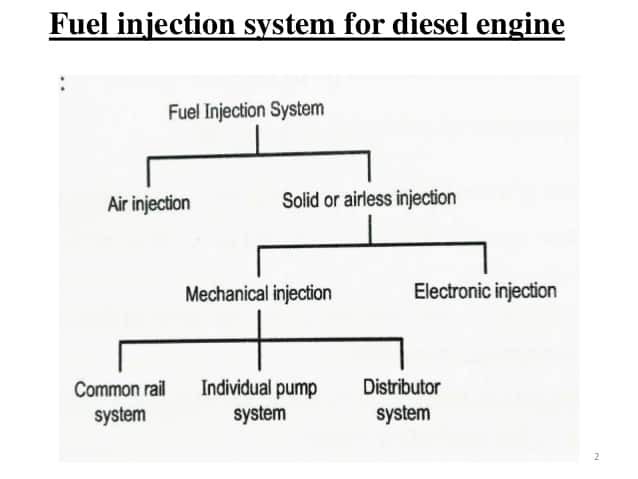 In this case diesel fuel is directly injected by fuel pump (Bosch Pump). As shown fuel will flow from the storage tank to filters to low pressure pumps. This low pressure pump pumps the fuel to 4 separate metering and pressure pumps. These separate metering and pressure pumps will pump the fuel to individual injectors which are provided in the cylinder heads. These are used in large slow speed engines. Fuel will flow from storage tank to low pressure pump through filters, then to metering and pressure pumps. This metering and pressure pump pumps the fuels to distributor unit which distributes and sends required quantity of fuel to each injectors/each cylinders. Used in small and medium size engines. In this case fuel flows from storage tank to low pressure pump through filters. Low pressure pump, pumps the fuel to high pressure pump, which pumps the fuel to high pressure pump, which pumps the fuel to common rail. Thus high pressure fuel is collected in common rail and from here through the metering devices required quantity of fuel goes to injectors/cylinders. Generally Cummins and multi-cylinder engines use this system. Electronics is introduced in automobiles in 1965. About 30—40% of cost of vehicles is for electronic items. Max power and best economy are attained by using electronics and computers in automobiles. EFI systems was various sensors to sense various parameters like temperature, pressure of gases, position of throttle valve, air flow rate etc. Sensors feed this data to Electronic Control Unit (ECU)—which is basically a computer. This ECU—processes the data and operates injectors and other devices to have maximum power, with best economy, and low emissions. Multipoint Fuel Injection system is used to supply air-fuel mixture of proper strength and in required quantity to each cylinder of a multi-cylinder engine, at all engine speeds loads. In this case injector is placed in the intake manifold, near the inlet valve. The injector sprays petrol into air flowing through the intake manifold. Homogenous air-fuel mixture produced enters cylinder. Note that each cylinder has a separate injector placed in its intake manifold. 3. More precise control of air-fuel ratio. In this case injector is provided at a single point in the throttle body. Throttle valve controls the amount of air entering intake manifold. Many manufacturers use different names for their implementation of fuel injection, below is a quick list of the most common ones. Which is a direct injection system as its name implies. Another direct injection system with some advanced ECU fuel management to provide the best amount of air/fuel mixture depending on the driving style (economic, sport, etc.) dynamically. The D4 uses the intake port central injection with two separate fuel injectors and the D4-S is the direct fuel injection implementation of Toyota. This implementation focuses mainly on fuel economy using direct fuel injection. Another direct fuel injection system. This is also direct fuel injection but Renault’s design focuses on fuel economy instead of performance. This is a single-point electronic fuel injection system. From its name is fairly obvious, direct fuel injection. Which is also direct fuel injection system. Using the design of Mitsubishi GDI system. Which is the equivalent implementation for engines equiped with turbochargers.